Yeisk sea trading port is located on the southern coast of Taganrog gulf of Azov sea where Yeisk spit begins. Longitude East — 38 degrees, 17 minutes. 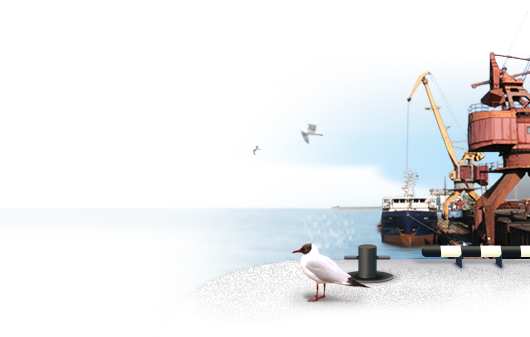 Vessels could approach port Yeisk by using arrival channel with length of 1,2 miles and width of 80 m. The guaranteed depth of the arrival channel and inner road (harbour) is 4,2 m, which is maintained by annual dredging works. All companies have own berths, warehouse areas, all necessary loading / discharging equipment. The total length of all 13 piers makes up about 1650 m. The stevedore companies handle berthing of vessels and perform cargo operations in round-the-clock mode. Piers correspond to the international standards and have necessary certificates for the maintenance of a full cycle of cargo handling works. They are equipped for this purpose both by portal coastal and mobile cranes which provide an universal and effective handling of various cargoes. The serving machinery helps to place cargo on the open or closed storage areas in optimal way. Cargo delivery into the port and export from the port is carried out both by trucks and by railway. Rail ways lead to each pier. Nomenclature of attended cargoes at port is quite extensive: Grain and products of their processing, logs and saw-timber, coal and fertilizer, metal products and scrap metal, general cargo and cement, food oil and petroleum production.